How to Write Fast and Well, Part 8: Block that Metaphor! (Also published at Huffington Post.) Last time, I talked about how to give your writing more impact by using nouns and verbs that represent objects and actions in the real world. It works because what moves us is emotion, and emotion is inherently physical. Today we take that lesson to the next level: from nouns and verbs to metaphors, which use objects and actions to represent ideas. The metaphor of "slings and arrows" has more force than just the idea of adversity: you can see the projectiles coming your way. So does "outrageous Fortune", which implies a being who can commit outrages. And the image of taking arms against a "sea of troubles" makes you see, and so feel, the futility. OK, it works for Shakespeare, so it should work for everybody, right? Used effectively, metaphors can make ideas come to life. But used ineffectively, they can make a mental mess. Consider this: "He unleashed a torrent of invective." At first, that might seem fine. In fact, you've probably seen versions of this sentence in many places (that's because it's also a cliché, but we'll talk about that another time). But ask yourself a question: Since when has a torrent, which is a fast-flowing river, worn a leash? Am I just being pedantic? No, if you care about impact, this actually matters. Look at Shakespeare again: his battle imagery adds up -- even when he describes a hopeless fight against the ocean. Remember, metaphors work by linking ideas to the physical world. That only works if the physical world still makes sense. If not? At best, it momentarily draws attention away from your meaning and towards your writing technique. At worst, it encourages a deadness of thought, wherein readers don't even notice when you're talking nonsense. His body leaned back against the sky. It was a body of long straight lines and angles, each curve broken into planes. So he's only made of straight lines and angles. How can he also have curves -- and in what brand of geometry can curves be broken into planes? At the Red Pen of Doom, writing blogger Gary Bergstrom suggests, "Maybe the only other people in this book are Flat Stanley and the Blob." The coattails of a successful favorite son can serve as a ladder to lift all life with access into the perfumed White House atmosphere of perks and power. Coattails that are also a ladder into the (perfumed) atmosphere? Gonna need a lot of starch. 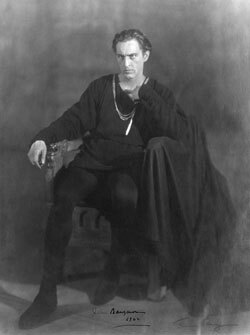 Photo: John Barrymore as Hamlet, 1922. Public domain via Wikimedia Commons.